You’ve worked and trained and dreamed about completing a big half-marathon or full-marathon race. You’ve looked forward to the event for months and made your race goals and strategy. Then when race day comes, something goes wrong! Your pace isn’t quite there, or its turns out to be a tougher course than you expected. At the end, you get a time much slower than you expected, and its devastating! Have you ever been through this experience? Well, this just happened to me over the weekend during the Famous Idaho Potato Half-Marathon. I’d like to share some of the thoughts I had leading up to the race, during the race, and now after the race. Although this is somewhat personal, perhaps you will find that you relate to some of my own thoughts – especially if you’ve recently had a bad race and perhaps are even contemplating whether you should quit running altogether. Leading up to the race, I was hoping to set a Personal Record in this half-marathon. Last September, I set a PR in the half-marathon with a time of 1:40:50 at the Lake Chelan Half. I was absolutely thrilled with that time! This was a big jump for me, and I even placed 3rd in my age group, which made me feel even better about it. I stayed in great shape through November of last year, and ran a 10 mile race with an average pace of 7:20 (approximately). Then during December and January, I didn’t work as hard, but was still running 4 to 5 times a week. In February 2013, I wanted to test where my physical abilities were after the winter “break” with the Tri-cities Half Marathon. I was NOT expecting a PR, but just wanted to run a nice and easy pace and be within a few minutes. I finished up with a time of 1:44 – which I was happy with. I felt like I probably could have run close to a 1:41 if I had pushed myself that day…which meant my physical ability was still pretty close to what it was from Sept of the previous year! So, I signed up for Boise Half Marathon with every intention of working hard and setting a personal best. The race was on May 18th, so I had about 3 months to get into great race shape. With that timeline, and back-story, you can see why I was fully expecting to set a PR. In fact, I decided to set a goal of 1:36:00 – perhaps ambitious, but still doable. Especially, since a 1:36:00 half marathon is a 7:20 pace, which is what I had run a 10-mile race at in November of 2012. I felt like I was very capable. The question wasn’t would I set a Personal record, but by how MUCH would I beat it by. What Happened on Race Day? My plan was to start slow, and get slightly faster as the race progressed. Starting out slow ensures that I don’t die at the end (supposed to). So, I wanted to start my first couple of miles at a 7:30 pace, and that’s exactly what I did. 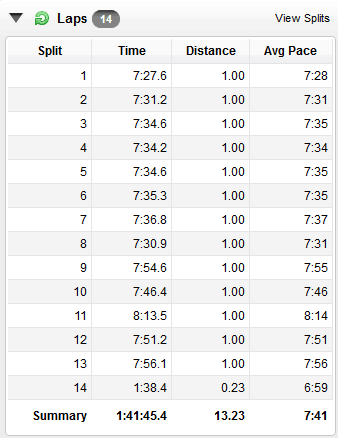 However, my next few miles were all supposed to be at a 7:25 pace, but instead they were closer to 7:35…what?? Well, as the race progressed, I just couldn’t seem to get into my race pace of 7:20 – my legs didn’t feel like they had as much power, and I was really laboring to keep my “slower than expected pace”. By the time I hit the half-way mark, I knew I was not going to hit my goal of 1:36:00…and this is when the mental breakdown began. I started telling myself that if I couldn’t hit my goal, then there was no real reason to keep trying so hard. I let my pace slip even more, and I both hated myself for letting it happen, and didn’t care at the same time. By mile 9, I just wanted the race to be over. Then when I hit about mile 10, I realized that I probably wasn’t even going to break my PR of 1:40:50 and this just made me have even more negative thoughts. I started thinking about how I hated running at that very moment. I thought, “Man, I’m no good at running anyway…why do I do this to myself?” As people continued to pass me, this just verified in my head how bad I was at running. I started to think that I should just quit running altogether after that race. After all, what’s the point anyway? Boy, I sure let some serious negative thoughts take over!! So, what was the end result? Well, I missed my PR by about 1 minute. My finishing time was 1:41:43. Yes, missing a PR by 1 minute doesn’t sound that bad, but when you are expecting to break it by 5 minutes….its a mental blow! I was obviously a bit depressed after this race. I was actually going to use this race as a measuring stick to determine if I should sign up for a full-marathon later in the year. Sure, I still have plenty of time to train, but do I want to sign up for a race if I’m not sure I can perform well? These are and were the thoughts going through my head immediately following my poor race performance. I’ve continued to question whether I should continue running since the race (just a few days ago). Sure, I know that sounds drastic. But what if instead of spending several hours each week running, I got involved in playing other sports or other activities that were perhaps less physically and mentally challenging, and perhaps even more enjoyable? However, I also have to allow myself to consider that perhaps my training wasn’t as stellar as I led myself to believe. And in fact, its true. I was mostly only putting in 35 to 40 miles per week and maxed out a couple of weeks around 50 miles – which obviously is plenty to finish a half marathon strong; but perhaps not enough to maximize your potential. So, while half of me wants to hang up my running shoes for a while, the other half of me wants to get back out there and train longer miles and developer a better training program to see what my old body can really do. Have you ever felt like that? Like you could go one way or another? This is where I stand now. I haven’t been running since my disappointing race, and I’m still figuring out what I’m going to do about it. So, this blog post is somewhat therapeutic :). In a way, its funny the mental games we play with ourselves. If I had gotten 1:41:43 in a half marathon exactly one year ago, I would have been ECSTATIC! But now, with what I felt should have been a big PR for me – its making me wonder about my running future. Will I be able to overcome what felt like a crushing defeat (to me)? I don’t know. I’m still debating what I’m going to do. But I can tell you that I am already contemplating what I could likely do if I stepped up the weekly mileage, and put together a more rigorous training schedule. I have no doubt that I if I trained like I know I should, I could hit a 1:36 in a half-marathon – and perhaps break my PR in a full marathon of 3:37. But is this what I want to do? Well, I have yet to sign up for another race, but I’ve covered the other 4 points here :). The reality is that I have set some serious goals for myself here, and in order to accomplish those, I need to continue running. So, if I want to accomplish my goals, I’ll have to dig deep and get over this mental set back. Time will tell. Stick around to see what happens. I would love to hear you thoughts, comments, or questions in regards to not only my own situation, but any bad races you may have had and how you dealt with them. Hey Chris – thanks for the support :). I think we have all had a bad race, and I guess I was just expressing in a very unfiltered way how I was feeling at the moment. I’ve been looking at the things I do enjoy about running, and I think you nailed it – I really enjoy the running community, the events, and perhaps most of all the journey of trying to constantly improve and stay healthy. I’m 13 and recently had a horrible track meet today. I was sick but oh well. I’m running my first marathon in 2 days but am having second thoughts. One of my old friends beat me in track and that made me do depressed! I had been out sick for a week but still, I’m devastated! My first half I ran when I was 12 I got a 1:37:28. What do you think my goal should be for the full marathon? Or should I even do it!? Spencer, I know what you are thinking. Last year I focused my training on the Rocket City Marathon. For 18 weeks I didn’t do anything, but train for the RCM (Dec. 8th). I did do 2 half marathons to test where I was and PR’d both of them with times of 1:39:20 (OCT) & 1:39:12 (NOV). I felt like I was primed to break my PR of 3:56. I was aiming for 3:45 in the race. It was hot on the 2nd Saturday in December, but I stuck with my plan. I got through the first half of the race in fine fashion and then mile 22 hit and I folded like a tent. I felt deflated. A friend who I helped to train for his first marathon finished in 3:53 (Yeah!). When I crossed in 4:03 I was deflated. I contemplated never running again, because I “Just can’t get it done!”. Well, I didn’t run for 3-4 days. Then comes the good stuff. I didn’t quit and since that point I’ve done a 12 hour race, 2 50’ks, knocking out PR after PR in other distances. Keep plowing my friend you never know when one “Let down” race will be the spring board to a series of great ones. Samuel – This is a great comment here, thanks so much for responding. It certainly helps me (and others probably) knowing that others have been through the same experience. And even better, you were able to bounce back complete longer distances and set PRs. Thanks for the motivational words…they DO help! This hits home for me too. I am a fairly new runner, about 13 months into it. I ran my half marathon PR of 2:02:27 on April 13th and set my goal as 2:00:00 at my half this past Sunday. The morning of was 76 degrees at the start so I told myself I would be ok matching or beating last months place. Well, I didn’t. I finished 2:02:28 – ONE second slower than my PR. I was and still am disappointed and keep kicking myself for walking the water stop and using the portojohn at mile 4.5. Jenni – I know exactly how it feels. And perhaps it is okay to feel disappointed, as long as that feeling drives us to something better. I’m still early on in my “healing” process to know exactly where I’ll go from here – but I want to learn from my experience and turn it into a positive. Hal Higdon sent me over to this blog post of yours. I wanted to start by thanking you for posting about your experience and your thought process. Your post is insightful and, I believe, resonates well with all runners. I’m a beginning runner. Last year was my first year of running, and I spent it gradually training for a Marathon distance. My sister asked me to do the Honolulu marathon with her. She lived in Hawaii at the time (military), and I live in New Jersey. I trained very hard, or what I thought was very hard! I didn’t care about speed, but only distance. I ran 5k’s, 15k’s, a half marathon, and then kicked up my final months of training to 20 or 23 mile distances on the weekends. During the Honolulu marathon, I got about 9 miles in, and my knees hurt so bad that I was afraid I had injured myself permanently. I thought, “This is pathetic. Maybe I’m just not made for this. I should just quit running.” Stopping at the first-aid tent to tell them I needed to withdraw from the race was one of the most difficult decisions I have ever made. (It’s embarrassing to admit: I had tears in my eyes!) But I was lucky I was even able to hobble to that tent. And this was not just disappointing, but bewildering. I had run over 20 miles two weeks ago in the hilly highlands of the Appalachians, yet now I can’t complete 10 miles in the (mostly) flat Hawaiian coastline. My sister finished her marathon run (5 hours 16 minutes, woo hoo!) and continues to run half marathons as frequently as her schedule will allow. I gave myself some time off of training when I returned home. I thought that I might not run again after a bad attempt at a marathon, but something kept nagging at me. I think it’s the desire to prove to myself that I can accomplish what I want that moves me. I just think about the idea of not hitting the pavement, of not hearing my heartbeat in my ears again, or not filling my lungs with air that never tasted so sweet (and I’m talking about New Jersey air). When those thoughts cross my mind, I know I have to slap on those running shoes and get out there. I spoke with my doctor (also a runner), and he recommended trying all different terrain when I decided to run again. And when a friend asked me to run a 5k with them in the spring, I slowly got back into training. As someone who never ran as a youth, I find that I have more impatience with my body. I expect it to function like that of an athlete (Well, like you!) And reading that someone with run times as great as yours has the same thoughts I do sometimes – Well, that gives me hope. I’m hopeful because I know that the thoughts about quitting are just that: Thoughts. And I’m not alone in those thoughts. In reality, its the decisions you make about your training, that decision to run even when you think you’re not performing at your peak. That decision to love the run, even if the run doesn’t seem to be loving you. I hope you find what it is that picks you back up, and soon! Happy running. Wow, Tina-Marie…thank you SO much for sharing these thoughts! It doesn’t matter that perhaps we run at a different pace, your thoughts hit home with me. Its interesting the thoughts we have when we don’t perform as well as expected. Running is almost as mental as it is physical; and perhaps having disappointments and overcoming them makes us stronger mentally – as well as builds additional character in other areas of our lives. Anyway, I hope you’ll stick around and keep encouraging me down the road, and perhaps I’ll bounce back stronger than ever…thanks! I’ve done this to myself before and had feelings of disappointment even when I PRed. I’m finding my favorite races & runs are when I let go of the numbers and go at a “fun” pace. That may mean speed one race, and slow and steady to take in the sights and race atmosphere the next. The numbers can make us lose sight of why we run in the first place. It’s good to take a step back and think about what you love most about running- then re evaluate what your doing. What is your number 1 goal? Is your approach helping you reach that goal? Hey Nicole, thanks for sharing. I agree that we need to take a step back and look at why we are running in the first place. I’m personally very competitive with myself, and therefore WANT to set PRs, etc. But I run for so much more than that – being healthy and living longer are a couple of big ones. Also, as you’ve implied, perhaps its not a good idea to put too much weight on one race…good advice. Been there done that. I am 60, started back into fitness three years ago. When I started, the ten minute warm up almost killed me. I was obease and a smoker for 35 years. Ran my first halfie in November, all by myself on a Sunday morning to get it in my head I could do the distance. Ran the second in December at an event and was let down by being off pace. In January I took a quarterly fitness test and was determined to do a PB on a 3k run. I did it and was struck down with Plantar fasciitis. I am cycling now till the ankle comes good. Over a month I went from 10k rides to 20, 35, 50 and then 80. Three weeks ago the 80k solo ride with 600m of climb, I made sure ‘my course’ took me 40k away so I had to ride back. The ride started off pace, I struggled with this in my head. The last 15k was hell. I never had so many negative thoughts in my life. I am over it, getting back on the bike and will ride till I can run again. Even if this old man comes in last on a halfie, I am ahead of 98% of mankind. Put the thumbs to the corners of your mouth, lift up, smile and get your running shoes back on. Anytime I run, I imagine what the finishing distance is going to be on my Garmin. Focus on the finish and you will get there. We all have good days and bad. Hey Eddie, way to rock the cycling! I’ve had a few days to think about my race, etc and your words resonate very well with me. I’m not sure exactly where I’ll go from here, but I do believe I’ll have my running shoes back on soon 🙂 . Thanks again! Thanks so much for posting this!!!! This sounds just like my last half. (It was only my third and I had only been running 15 months.) I was 7 seconds over 2 hours for my 2nd half. Based on my training, I really thought I could do 1:55, and possibly 1:53. I was crushed that I ran 1:58:40. It was a PR and I broke 2 hours, but I really bummed. I didn’t even consider quitting. I finally realized everything didn’t come together that day. The 10K one month before was perfect and better than I thought with a great PR. The 5K a month after that was fantastic, even though I didn’t PR. I ran the race the way I wanted and I won a 10 year age group, and I’m at the end of the group. Funny how a non PR race, but run the way I envisioned was so much more satisfying than the half I PRed. Funny how this so mental. The biggest thing I learned as that no matter how well you train, it just may not “happen” on that day. Then again, it may. Just go out, do your best, and learn for next time. I still love running and hope I can stay healthy and fit enough to keep going. Again, thanks for posting. It’s so nice to know I’m not alone. I don’t think its silly…I think everyone needs to decide WHY they run and to enjoy the journey. I think we can use running to represent our life. In life i need to be reponsible for my own actions; for example if something at work does not go as planned I will not quit work I need to first of all accept that things dont always go my way, or the way I planned them to be, and secondly keep moving forward in a positive direction. You are a good runner, it’s shown in your race times and you need to give yourself a break, and ask yourself “why do I run?” We all are tough on ourselves, we all have goals and PR’s that we want to beat. I personally run for fun and friendship, of couse I have PR,s that I want to beat, but i try to make that the last on the list of my priorities when entering a race. I am not an olympian, my life does not depend on that time, noone else will be disappointed except m if I dont finish where I’d like to. Now get off your computer, get on those runners and get out there! I’m glad that you are back at it again. I actually ran into your blog because I just had the worst run since I started running. I started running last year and had a horrible first half, but I was fine with it as it was my first. I was also in a lot of pain, and had done really good practicing, so I was able to deal with the disappointment. That run was in December of last year. I kept thinking about it and realizing that I never thought I could ever run that much or that far and felt that I needed to do more, so I signed up for a full marathon in November. I felt so good about doing so. I was so eager for that day to arrive and accomplish something that I never thought I could. I did a few more races and improved my half marathon time by 20 minutes. The thought about running a full marathon was so overwhelming, but at the same time I wanted to go the distance. I did sign up for a run that was going to be meaningful and that was for something. I knew I was going to need the motivation to get me through the distance mentally. I found one that was a run in remembrance of 9/11. Needless to say the run was yesterday and I did horrible. Actually I did not even finish the run. I felt really awkward I started running out of breath at mile 3 and I felt as though I was running too fast and I was not going to be able to keep the pace. I was only running at a 10 minute mile pace, but for some reason I felt as though I was flying. I kept slowing down more and more until finally at mile 6 I started to run and walk. I figured well I’ll just speed walk and get through as many miles as I can. I kept thinking about why I was doing the run. I kept telling myself “It’s for those who died on 9/11”, but kept doubting myself and wondering why I had this weird felling in my chest and why I had quit in such a short distance. I was hoping that I would come to my senses and start feeling ashamed about slowing down. I finally gave in at mile 9.11. I could not continue on. I did not even wanted to grab the medal they were giving me because I had finished one of the other races they had which was 9.11 as why we were doing the event. I’m kind of glad I took it as it will be a remembrance of how low it can get at times. I do not want to quit running, but I’m really confused and disappointed at myself for not being able to keep going. My furthest distance was 18 during practices. Today it’s another day and as I think more and more about it I keep getting more disappointed at myself that I want to get up again and do it all over on 9/11 and this time try to complete at least 20 miles. I’m just afraid of failure again. The weather was hot that day, so my friends mentioned it was probably because of that, but I just could not explain what I was going through and was so upset at myself that I was not going to be able to even get a half marathon done. I have quit before during runs when the weather was hot, but this run was for something it was not about me and I let the negative thoughts get to me. Thanks for sharing your thoughts Olivia! I totally understand your feelings…and I bet there are LOTS of other people reading this that have been through something similar. I don’t have any answer as to why you felt the way you felt. However, I will say that amazing things can happen through consistent training and if you stick with it. I always have to tell myself that I don’t just run to finish races, but also to keep myself in great physical condition and to extend my life. I really do wish you all the best of luck in the future! I was in good shape but raced a 5k hoping for 16.30 minimum but ran 17.14. I didn’t feel like i was moving well at all. I ran a 10k few weeks before and ran the second half of it in 17.30 which was a hilly course so i was certain to go 16.30 on a flat course. Things which could of went wrong was the race started at 7pm and I’m not used to running at that time. It did ruin me mentally when i was down over first mile by 15seconds and feeling tired in my legs. I ran my 2nd half marathon 3 days ago and feel a total failure -why? I hadn’t done half As much training yet kidded myself I could do it anyway .